This site presents a model of the universe as the surface volume of an expanding, hollow, four dimensional sphere, termed the hyperverse. It leads to insights about the nature of time, and gives us a model for the creation of matter and gravity. New paper added on 1 February 2016 showing that we can use the geometry of a 3-sphere, expanding at twice the speed of light, to calculate the radius of the observable universe, further supporting the contention that the universe is the surface volume of an expanding 3-sphere. Paper added (4 December 2015) that shows how well the hyperverse model fits into the Friedmann equation. It shows that the universe is undergoing a constant expansion rate. The universe is not a Friedmann-Robertson-Walker universe. On this page, we will briefly review some of the concepts presented on this website. Links to pages with more details are provided. In the book, “Three Roads to Quantum Gravity”, Lee Smolin suggested that space might be composed of discrete units, “atoms of space”. This concept morphed one night, in 2007, into the idea that if space existed as an entity, then gravity might be the absorption of space by matter. Curved space is commonly visualized using a rubber sheet with a heavy ball placed on it, distorting the surface. The closer to the ball, the greater the degree of curvature of the surface. We can model the absorption of space by matter using a tub of water and pulling the plug. The closer to the drain hole, the faster the water moves towards the drain. 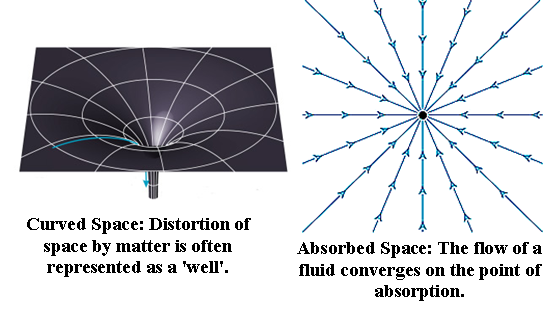 Absorption of space would produce an inverse-square relationship, exactly as seen with gravity. The model suggests that the curvature of space is really a measure of the velocity of space. A Model of Matter Based on Atoms of Space. If atoms of space had an asymmetrical aspect, we could create a basis of electrical attraction and repulsion. 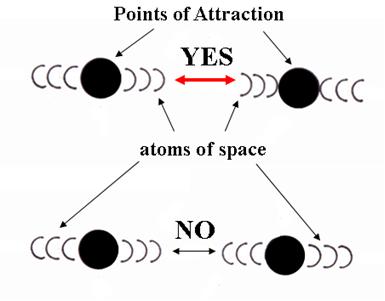 Using an asymmetrical atom of space, we can visualize a physical model for electrical attraction, based on the orientations of the atoms of space to one another, as shown in the above drawing. A spinning atom of space would have a north and south pole, and we could orient either the north pole or the south pole towards another spin orientation, as seen in the drawing. Asymmetry is achievable with spin orientation. To help visualize it, imagine two power drills, each with a spinning sanding disk, and two people holding the drills. Bring the disks together, and there would be a crashing, repulsive, response. Reverse one of the drills, and the drills's sanding pads could actually bind together, turning in unison. This is how electrical repulsion and attraction at the quantum level works. We get either attraction or repulsion, depending on the orientation of spin. Using a rule that we can have six points of connection per particle, we can create a model of the electrical structure of all elementary particles. Visualize a cube, which has six faces, each face with a spin orientation. 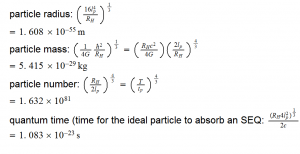 Notice in the table below, that this simple approach gives us all the fractional charges and anti-particles. The "Image" column is a two-dimensional representation of a three-dimensional arrangement. The 'nu' notation, as is the rest of this, is explained on the particle page and paper. We can build proton and neutrons using the model. 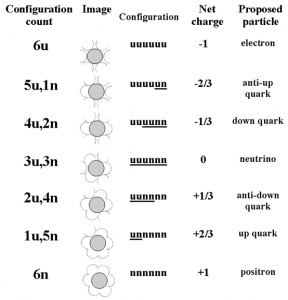 A proton is composed of two up quarks and one down quark, giving it a 12n6u configuration. 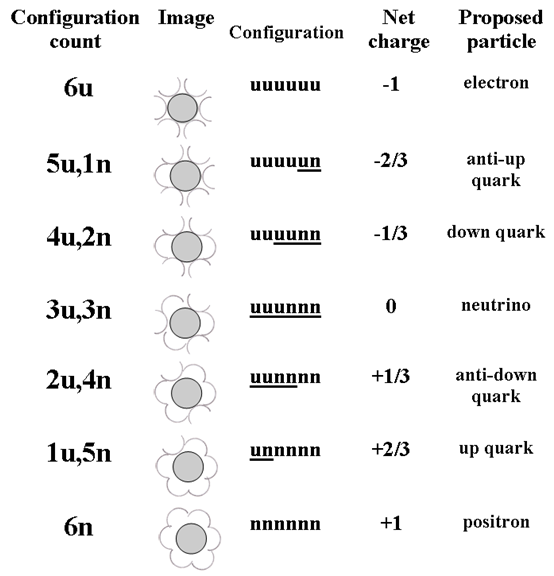 The proton has a net one positive charge, but it still has those six negatively oriented quanta. We can conclude that the proton has a hidden, full negative one charge within it, giving us an explanation for why the electron does not fall into the nucleus; it is repelled by the hidden negative charge. See: particle paper, particle page. The Dark Matter Particle is Probably a "Condensation Neutrino"
For brevity, see page and paper. If atoms of space exist, they must take up space, by the very definition of space. Since atoms of space take up space, and the universe is expanding, we can ask, "where is there room for the additional atoms of space created by expansion?" In a 3D universe, all the atoms of space are surrounded, on all sides, by more atoms of space; there is no room for any more. This 4D ‘hyperverse' would have a radius, a radius in the fourth dimension. We can ask: “how big would this 4D hypersphere be, if it were the size of the observable universe?” The radius of the 3D, observable universe is about 46.5 billion light years. A 4D hyperverse, whose surface volume matched the volume of the observable universe, would have a 4D radius of about 27.6 billion light years. Given that the universe is about 13.8 billion years old, we find that the observable hyperverse is expanding at twice the speed of light, or 2c. We have several important considerations here. 1. We get an expansion rate that is exactly twice the speed of light! Is this a coincidence, or is it significant? Many people will just say it is interesting but has no significance and let it go. We claim that this is an astoundingly important result, and will develop this simple observation into a full-fledged cosmology that gives us a model of time, tells us the nature of the expansion of space, why quanta exist, what the Planck values really are, how big the whole universe is, and what matter and gravity are and why they exist. 2. A 2c radial expansion might make you say to yourself, "Hey, wait. Nothing can move faster than the speed of light." But relativity applies to motion within the universe; whereas this is motion of the entire universe, of every point in space into the fourth dimension. The 'platform' is moving at a constant velocity of 2c. 3. The whole hyperverse must be larger than the 'observable hyperverse'. The model we develop actually gives us the size of the whole hyperverse, or universe, at 10^243 times larger than the observable. Since the whole hyperverse is larger than the observable hyperverse, the true radial expansion rate would be much greater than 2c. But we measure 2c. Solving this '2c dilemma' gives us quantum time. We show that the ratio of the unit of SEQ quantum time to the SRQ unit increases at exactly the same rate as the rate of expansion of the whole universe, giving us the constant 2c velocity we actually measure. We can use the hyperverse model, a time-scaled 3-sphere, expanding at 2c, to create a simple algebraic equation for the radius of the observable universe. The 2c radial expansion of space is the foundation of time. The radial expansion, into the fourth dimension, gives us the one-way arrow of time, as well as a basis for the quantization of time. The atoms of space, the building blocks of elementary particles, produce relativity. Since every point in space is at the edge of space, and every point in space is moving into the fourth dimension at twice the speed of light, we are not long in one spot. We calculate the length of a moment in the geometric mean paper. For more information, see: page, paper, videos. Quantum Time is the Time it Takes an Elementary Particle to Absorb a Quantum of Energy. 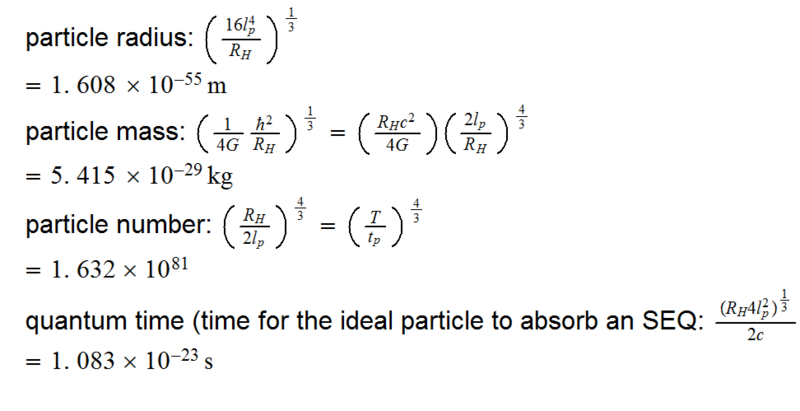 We show that the quantum time value of an elementary particle is the time it takes the particle to absorb an SEQ quantum of energy. Quantum time, quantum energy, and quantum gravity are all connected. This paper also shows that our value for quantum time, derived from the hyperverse model, actually matches the Piero Caldirola equation for his 'chronon', for the classical electron. This gives us two different equations for the value of quantum time, and equating them gives us the correct equation for the value of the electric charge. The unit of quantum time is not constant, but increases with expansion. The rate of increase of the ratio of the unit of atomic time to cosmic time matches the increase in the expansion rate of the whole hyperverse, cancelling it, giving us the 2c expansion rate we measure. See the paper. We show in the quantum time paper that, due to the geometric mean expansion of space, the SEQ absorption time is related to the energy of an elementary particle via the time-energy uncertainty relationship. The quantum time - the time for the particle to absorb a quantum of energy - for any elementary particle is easily calculated using the time-energy uncertainty relation. We can use the hyperverse concept to find a value for the mass and energy of the observable universe, which we do in the Hubble paper. We can then calculate the rate of change of the energy of the observable universe, getting a value for "delta E sub o". Using delta E for the observable universe in the time-energy uncertainty equation, gives another striking answer, the Planck time squared. This leads to the idea that the universe is undergoing a geometric mean expansion, where the large of the universe gets larger, and the small of the universe gets smaller. The geometric mean expansion appears to produce two quantum levels, one based on the radius, and the other on the energy, of the observable universe. It appears that the very reason quanta exist is because of the geometric mean expansion of space. The energy quantum appears to be the quantum of our quantum mechanics, while the radius quantum is much smaller, and appears to represent the whole universe. Those 'atoms of space' turn out to be quanta. The geometric mean expansion also provides an explanation for the significance of the Planck values. The Planck values have no known physical significance, but in the hyperverse model, the Planck values are preserved as geometric means. They are historical values, the initial values when expansion started, conserved by the geometric mean expansion of space. And how can a universe come from (almost) nothing? The geometric mean expansion of space suggests that the universe comes from itself. In the paper on the origin of matter and gravity, we find an explanation for the existence of particles of matter. Matter is condensed space. We discuss that the angular momentum of the expanding hyperverse is increasing rapidly. The reason for this is that the number of surface vortices is increasing as the hyperverse expands. Several equations continually pop up in the hyperverse work, giving values very close to the mass and the Compton radii of elementary particles, and to the number of elementary particles in the observable universe. We advance the idea that these values represent target values that the universe is striving to reach; that the expanding universe is crushing and coalescing the quanta of space in order to conserve angular momentum. The result of this crushing and coalescence of the quanta of space is the creation of elementary particles. The equations giving us the ideal particle show that elementary particles are not static entities; they change as the universe expands. Matter is dynamic. Due to the continuing expansion of the universe and the associated continuing increase in its angular momentum, particles must continually accrete the quanta of space, and the particles are continually being crushed down even more. All the while, the universe continues to create additional particles of matter. For example, an electron today is not the same as an electron yesterday, or tomorrow. Matter is dynamic, changing as the universe expands. The need to conserve angular momentum is the reason all particles of matter, of a kind, are identical, everywhere in the universe; all particles are conserving the same, the initial, value of angular momentum. Gravity is the Ongoing Process of Particles Accreting the Quanta of Space to Conserve the Increasing Angular Momentum of the Expanding Universe. Matter is dynamic, and particles must CONTINUALLY accrete the quanta of space. This ongoing accretion of space is gravity. See page, paper, videos. Matter is made of space. Matter continually absorbs space. The absorption process is gravity. The FRW model of the universe assumes all matter and energy was created at the time of the Big Bang. Fred Hoyle's Steady State theory is based on particle creation continually occurring for all time. Hyperverse theory states that matter is continuously created, but starting at the Big Bang. Placing the hyperverse values into the Friedmann equation shows a constant expansion rate, confirming the constant 2c expansion rate we get for the radial expansion. See the paper. So that is a very brief summary of the work to date, ready for sharing. The website has the details, and gives many more interesting results that this hyperverse model produces. I welcome you to explore the site. Feel free to share your thoughts. This site went live in July 2014.